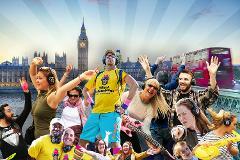 It's a Flash Mob, it's a Silent Disco, It’s a roaming, rhythmic riot through London! Join the Silent Adventures Team as we take you on a journey of song and dance through the famous streets of London. This musically instructed adventure aims to have your funky moves on display and your pop star voices serenading the people of the capital! Hi-tech headsets will fill your body with beats, theme songs and your favourite hits from across the decades. As your inhibitions evaporate and laughter takes over, you will be part of the best all-dance, all-singing walking tour in town! Ganging up with your super-stylish leader at the starting point, you’ll groove down the historic streets, passing famous landmarks, performers and the public - looking on in awe and jealousy! Wear comfy shoes, bring water, an open mind and the whole family! (Over 5s only and no buggies, please. Babes in arms welcome). Please make sure you arrive at The Admiralty on time where you’ll be given your headphones and taken to the starting point. Show your Silent Adventure ticket at the bar on the day of the tour to receive 20% off your food & drink bill! The tour will last approximately 60 minutes. We can’t wait for stragglers, so please be sure to arrive on time to avoid missing the adventure! Please read the terms & conditions. Guests waive all liability for damage, injury or loss on tours. Our tour finish locations vary but fall no further than a 10-minute walk from the starting point. It's a Flash Mob. it's a Silent Disco. It’s a roaming, rhythmic riot through London!